I have been chiding Damon for his inexplicable ability to avoid Marlie's poop. It has been over a month since he last changed a loaded diaper. Last Sunday as I placed Marlie on her changing table I asked him to watch her while I used the bathroom. I guess he felt guilty and decided to change her. I returned to a contamination zone! There was poop on the changing table cover, her clothes, her hands...creating more work for me! Suffice to say he has been out of practice and not used to changing poopie diapers on Marlie the Squirmer. I told him that he can't handle the poop! I also took him off diaper duty. Wait. Maybe that was his agenda all along. We survived Marlie's first bad cold. I took her to the pediatrician on Tuesday when she spiked a fever. Turns out she also had a mild infection in both ears, but not the type that needed antibiotics. She goes back next week for her wellness exam and hopefully her ears are all better. The cradle cap returned this week, and I'm convinced that it is triggered by a food allergy...probably wheat. I am sensitive to wheat/gluten and usually avoid it like the plague, but sometimes I fall off the wagon then I get acne and psoriasis of the scalp. I think her cradle cap is an allergic reaction to wheat products because her cradle cap usually coincides with one of my break outs. 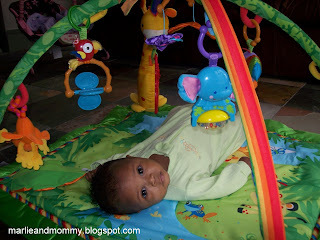 Her Granny Marge bought her a jungle gym/activity mat for Christmas (see photo...notice how she likes to pose for the camera). Actually, it's a rain forest. It plays nature sounds and has the cutest hanging animals toys, including a giraffe holding a pineapple-shaped mirror (are there giraffes in the rain forest?). She loves it! I won two more giveaways this week: an Inspired by Finn Amber Teething Necklace from the blog SubUrbanly Crunchtastic and a set of Monkey Snuggle cloth wipes from the blog A Bittersweet Existence. boo-ya! I feel like I have finally hit my stride as a mommy. I know more challenges lie ahead...teething, putting objects in her mouth, nursing strikes, but I am ready to face them. My husband had the poop avoidance gift too. But now as she is older and IT IS WORSE, she likes to wait til she is alone with daddy to poop so he is stuck. Cracks me up! That jungle gym looks so cute and fun. I'm glad that the worst of the cold is over. It is so scary. My son was never sick but Abby was sick all the time. Happy 4 months to all of you! Happy quarter birthday Marlie! I can't wait to see the two of you tomorrow for lunch. I can't believe she is 4 months old already! Time flies. I had to avoid dairy with both of my girls, and most likely will with this one. I happened to know Marlie from your first posts. I can't believe she is already 4 months!!. She is a really good-looking little girl! Whew! Glad the first bad cold is over. It can be so heart-breaking to hear your little princess stuffed up and feeling yucky, and not being able to do much about it. Also, a big smile spread across my face when I read "I feel like I have finally hit my stride as a mommy". I LOVE IT! Congrats to Kim for being the first comment and winning the Ballpark Franks coupon! Thanks for stopping by my blog today, Glad you liked the ornament idea! thanks for the words of encouragement ladies! Lord knows there are days I feel like a parenting failure, but I've learned from these moments that I'm not super human. As far as I can tell my hubby is just lucky in the poopie diaper department...she is always just wet when he changes her. she saves all her poop for me! That is hilarious! If you hubby ain't a poop diaper changer...don't make him do it! Give him some other duty that he can perform well then in time...he'll tackle the yuckier ones. Remember it's Hubby and wife first...then baby...I know it's hard to think that in the wonderful throws of the first year. Enjoy this time it's great! Blessings. I can't believe how big she is getting!! Funny how Dads seem so adept at avoiding poop. My son is 23 months and my husband still asks which way is the front. So sorry to hear she had a cold. Sick babies are so sad. My hubby is the opposite, he is hyper careful lest some molecule of poop stray from its intended destination. It takes him 10 years to change a diaper, but I appreciate it. Glad to hear that things are going so well. Mobility was my downfall. She is finally beginning to get where she will stay in one place and play for a few moments. She may have allergies also, she has major skin issues and unexplained bouts of vomiting. Gluten is hard to avoid, I do not envy you! I find it amazing how much we chronicle with that first baby...and how much time we lose with the second and so on. I like to think that if I stayed at home instead of working outside it, I'd be much better at chronicling my second son. As it goes, I won't keep much or anything that I did for my first that I'm not able to do for my second. It's only fair to pretend. LOL For their sake and sibling rivalry.